This post was written by Guest Contributor Habeeba Husain. Habeeba blogs at My Future is at My Finger Tips and tweets at @HabeebaHusain. Nagla Bedir (left), and Luma Hasan (right) via Education Votes. When a Rutgers University student finally found a seat on the campus’s usually overcrowded bus, she witnessed the Caucasian man next to her shoot her a dirty look and abandon his seat. “That experience really shaped my perception of how Muslims are treated in the country because before that, I had never gotten anything so overtly Islamophobic,” says Nagla Bedir, now a high school social studies teacher in N.J.
That day was the first of Bedir’s hijab wearing journey. Prior to her donning the headscarf, the former pre-med student was often mistaken as Latina and wasn’t as much of a target for Islamophobic behaviors. While Bedir chose a field in education during her university years, her friend Luma Hasan knew she wanted to be a teacher since she was 7-years-old. The two young educators met two years ago at a conference called “Urban Teaching Matters” in New Brunswick, N.J. Through their conversations and shared experiences, they realized they needed to create a safe space for Muslim educators in the public school system. But Hasan and Bedir are doing something about it. 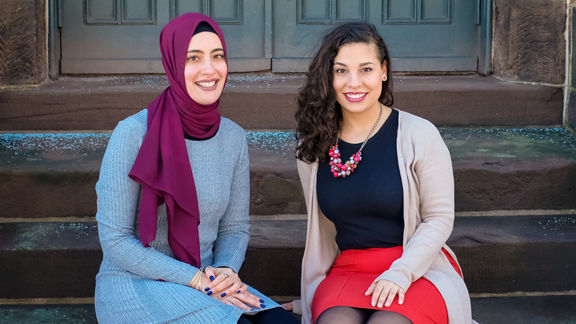 Together, the pair founded that much-needed safe space and called it Teaching While Muslim. “We gave ourselves a platform to amplify our own voices and the voices of our Muslim educators, our Muslim parents, and our Muslim students,” Bedir says. Teaching While Muslim is a multi-faceted project. It’s a platform that tackles issues Muslims face in the public school system. It’s a network for Muslim educators, as well as an organization providing professional development, training in bias, intersectionality and social justice to institutions, through workshops. Both Bedir and Hasan have many intersecting identities—being Muslim, being Arab-American (Egyptian and Palestinian respectively), and identifying as women to name a few. Both of them also recall their teachers dismissing these identities when growing up. This is not an uncommon phenomenon, unfortunately. For some young girls, not only will a teacher dismiss her Muslim identity, but will mock her for it. Today in their classrooms, these two Social Studies teachers make sure their students know they are deeply cared for and can have an absolutely open relationship to ask questions and get answers. In a previous school year, Hasan relates the story of one student who submitted an assignment that explained how Muslims cannot assimilate to Western culture because the differing mindsets of the two civilizations make it impossible to do so. Bedir remembers a similar situation in a summer program she taught that saw many international students in her classroom. At the end of the three-week course, one of her students from China spoke in front of all the kids, teachers, and parents explaining how he used to believe Muslims were terrorists, but by interacting with Bedir, he changed his mind. While she herself doesn’t fit the media concocted mold of what it means to be Muslim, Bedir says she can’t speak for all Muslim educators because everyone has different experiences. Hasan, too, is a walking example that Muslim women are no monolith. This kind of diversity within the Muslim community is just one of the things Teaching While Muslim would like people to understand. The organization also works to better the curriculums in American schools to emphasize the contributions made by all people. So far, the feedback for Teaching While Muslim has been quite positive. The organization is receiving requests for more workshops and visits to help educate teachers and administrators about fighting implicit biases, discrimination, and institutionalized racism. Teaching While Muslim clearly did fill in a missing hole, as Bedir and Hasan explained the changed mindsets in two of their students. They are doing their part to eradicate the dangerous ignorance, so that hopefully in the future, marginalized groups won’t have to face as many adversities at the hands of their peers on the bus and elsewhere. Their educating practices are bridging the divide that exists in our curriculums, in our behaviors, and in our thinking. If you’d like to learn more about Teaching While Muslim, visit their website and stay updated with their future projects.